Badminton is truly one of the most exciting sports to play and watch. In fact in 1992 badminton become a medal sport in the Summer Olympic Games, bringing forth many talented athletes from all over the world. The game of badminton involves opposing players using a racket to hit (or volley) a shuttlecock back and forth over a net without allowing it to hit the playing surface. It is the world’s fastest racquetball sport – a shuttle can leave the racket at a speed of almost 200 mph. The game demands high concentration, quick reflexes, rapid hand-eye coordination, and stamina. 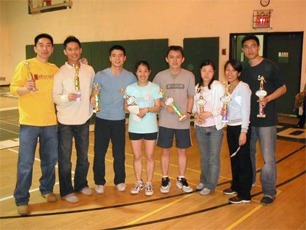 To meet the needs of the community, the United East Athletics Association’s badminton program was formed in 1999 among a handful of very enthusiastic badminton players. Since then it has provided members with an outlet to release their stress, get in shape, have fun, and meet new people from all walks of life. Experienced players serve as coaches to beginners who learn various footwork, hand strokes, and strategies. Through continuous practice, each player develops aerobic endurance that helps them better compete in the game and also in life. The energy that is ignited by the passion and love for the game remains one of the reasons why the badminton program continues to be in such high demands.